Mia Yung I am validating that this deal works as described. 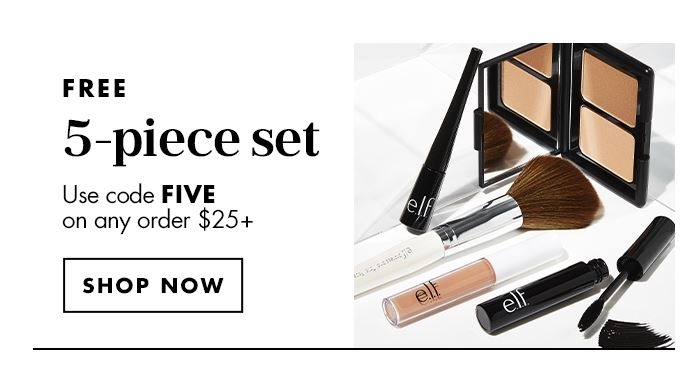 Spend $25+ and Get a Free Five Piece Gift at Elf Cosmetics. Add product to cart, creating a minimum bag value of $25. Enter coupon code FIVE at checkout to get a FREE 5-Piece Gift valued at $12.00. Limit one per order at promo price. Limit one-time use. Offer is not combinable with other promo codes. Offer valid while supplies last. Any out of stock item may be substituted for item of equal value. Offer valid until 11:59 PM PT 7/24/2017. Carlos I have verified that this deal works as described. Go to the link, make an order $25 + and go view your shopping bag, place the promo code and enjoy the promotion. Vicki Floyd I am validating that this deal works as described. 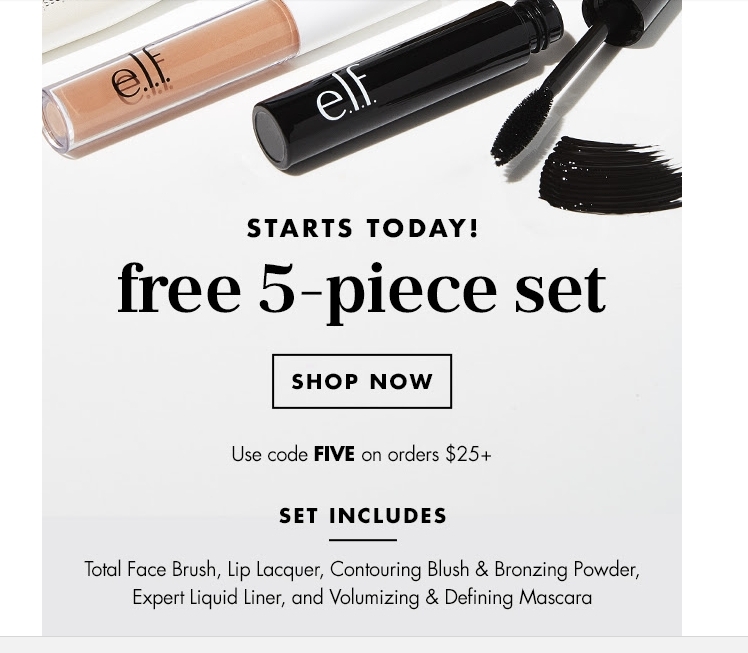 Apply the promotional code to receive a free 5-piece set. Cole Martinez FREE GIFT! 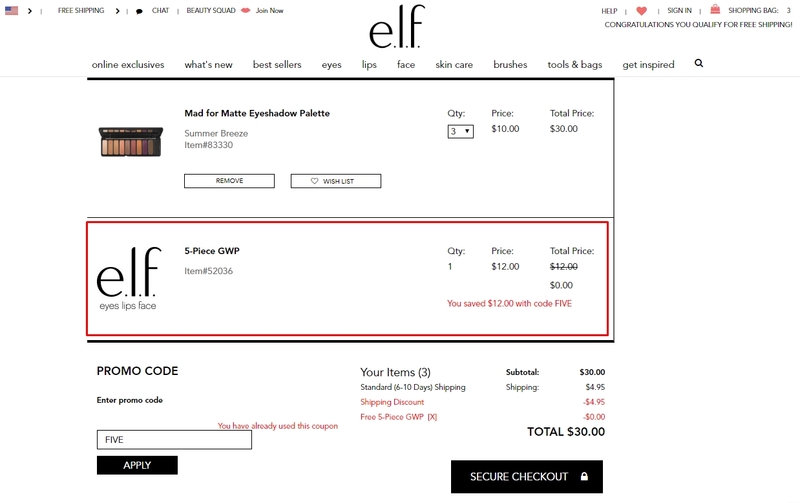 Add product to cart, creating a minimum bag value of $25. Enter coupon code FIVE at checkout to get a FREE 5-Piece Gift valued at $12.00. Limit one per order at promo price. Limit one-time use. Offer is not combinable with other promo codes. Offer valid while supplies last. Any out of stock item may be substituted for item of equal value. Offer valid until 11:59 PM PT 7/24/2017. 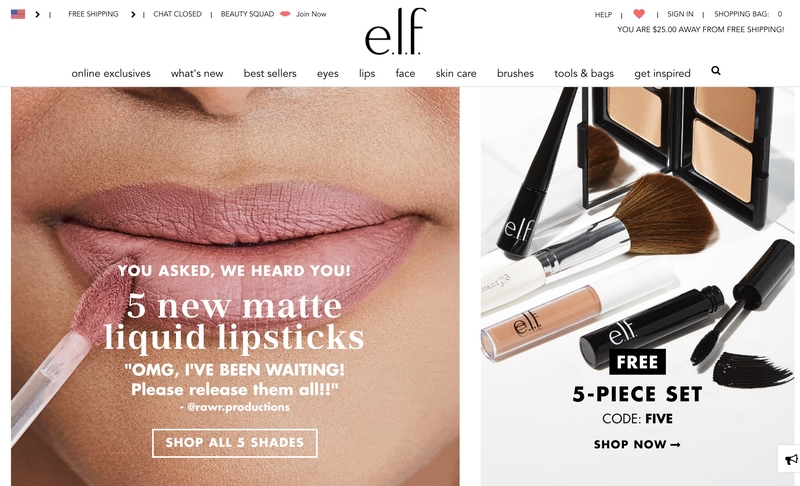 Ashley Drewes I am validating that this coupon code for Elf Cosmetics is currently active and is working as it is described. 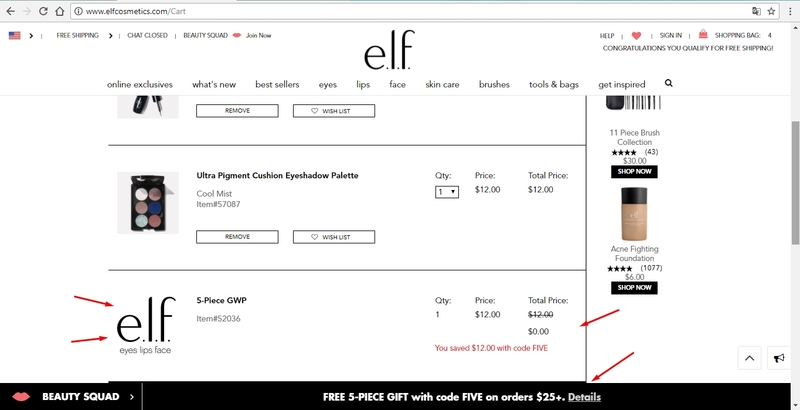 Laura DeLuca Add product to cart, creating a minimum bag value of $25. Enter coupon code FIVE at checkout to get a FREE 5-piece gift valued at $12.00. Limit one per order at promo price. Limit one-time use. Offer is not combinable with other promo codes. Offer valid while supplies last. Any out of stock item may be substituted for item of equal value. Offer valid until 11:59 PM 7/24/2017. 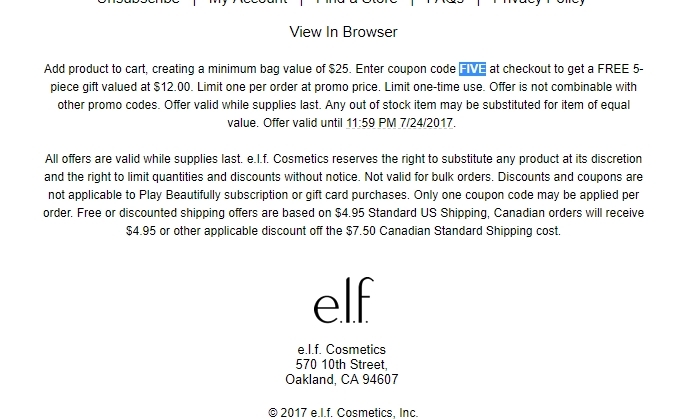 Tiffany O This offer is valid through July 24, 2017 only at Elf Cosmetics website. Enter the promo code at the checkout.